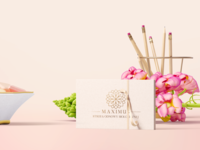 Logo presentation — Logo presentation for Maximus spa. Logo for spa & massage — Logo for spa & massage based in Europe. Rollup — Just a rollup i made for European Blockchain company. Watermelon doodle — Made with help from tutvid.